Maine's agricultural sector is large and diverse, contributing significantly to Maine's overall economy. Data in the 2012 Census of Agriculture by the U.S. Department of Agriculture (USDA) National Agricultural Statistics Service lists 8,173 farms in Maine. Most Maine farms are small, family-operated enterprises employing few people beyond family members, with the median size of farms being 67 acres. The 2012 census lists 2,415 Maine farms reporting a total of 15,072 workers (hired farm labor, excluding contract workers). However, 4,229 farms reported 10,698 unpaid workers (agricultural workers not on the payroll who performed activities or work on a farm or ranch), essentially reflecting the number of family members working on farms. Of importance to our demographics survey, 125 farms reported hiring 2,706 migrant workers. In effect, 18% of paid hired farmworkers reported by Maine farm operations are migrant workers. A migrant worker is defined as a seasonal farmworker who travels to find work and is unable to return home at the end of the workday. Since the early 1990s, Maine has seen an increase in hired migrant labor; growers rely on migrant labor to harvest their crops. Despite their significant contribution to Maine's economy, not only through their hard work on farms (they comprise 18% of hired farm labor) but also as consumers who spend their earnings in local stores and services, MSFWs arriving in Maine go mostly unnoticed by the general public. This report was undertaken to shed light on both who are the migrant and seasonal farmworkers (MSFWs) coming to Maine and where they are coming from each year to raise public awareness about this important sector of Maine's workforce. The survey was carried out using a questionnaire made up of 44 questions organized by five topics: Family Composition; Living and Working; Type of Work Prior to Maine; Work Activity While in Maine; and Destination, Work, or Activity after Maine. During the interviews, Spanish or English versions were used as applicable. The survey was conducted under the supervision of the State Monitor Advocate for MSFWs by Treva deMaynadier, a summer intern in the Maine State Government Summer Internship Program of the Margaret Chase Smith Policy Center and who is bi-lingual in Spanish-English. In all, 52 surveys were completed and the data results were tabulated in an Excel spread sheet. To conduct the survey, trips were made to employer-owned farm labor camps. In early June, migrant workers arrived for the broccoli harvest in Aroostook County and 16 (or 30%) of the 52 surveys were conducted there. However, from initial conceptualization, the project’s intent was to interview MSFWs working the blueberry harvest, which occurred between July 30 and August 14 of 2015. 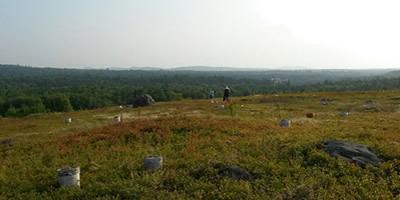 The rationale behind conducting the survey during the blueberry harvest in Washington County was based on this area being where the largest concentration of MSFWs can be found at any one time in Maine. In addition, most of the MSFWs in this area are accessible because they live in housing provided by the large, blueberry-growing companies. However, the conduct of the survey did pose some challenges. The first challenge was that the process used a cold-call approach to ask the subjects to partake in the survey. Another challenge was presented by Haitian workers who spoke only Creole; surveying these workers required finding an English speaker among them. In almost every case, the workers approached were extremely accommodating and sat for the interview. The report contains an introduction written by the intern, Treva deMaynadier, outlining the project and her personal experience conducting the survey. It also contains charts that illustrate the findings statistically, a sample of a Google map created to give place and context to MSFW routes of travel, sample copies of the English version and the Spanish version of the questionnaire, and eleven narratives or "case briefs" that bring to life the percentage numbers reflected in the charts. Each narrative is a descriptive view of the lives of those MSFWs interviewed, reflecting the challenges and rationale of traveling so far to find work. The hard copy of the original project, including the surveys, will be kept on file in the State Monitor's office, in the Bureau of Employment Services. Because the survey was ad-hoc, and workers surveyed were those who were available at a specific time and place, the statistical outcomes are to be considered a small representative sample of the larger total of MSFWs present in Maine during the 2015 broccoli and blueberry season. For example, in Down East and mid-coast counties, employers reported that 1,560 migrant workers were hired to work the blueberry harvest and 297 were hired to work broccoli in Aroostook. The value this ad-hoc survey provides is the narrative experience of real people, as opposed to a statistical profile. This offers a qualitative balance to the otherwise expected numerical, quantitative data. Why is this important? It is important because the results of this survey, supplemented by the narratives, provide an insight to the lives of MSFWs, telling us who they are. It also illustrates their social organization, their support networks, and how their desire to improve the lives of their families provides motivation to travel great distances and make sacrifices to find work. This survey provides opportunity for state agencies, legislators, and the public to learn who MSFWs are and to understand why they come to Maine, given the fact that they comprise 18 percent of hired farm labor in the state. It is hoped that the information provided in the small survey will also assist in determining ways to better assist MSFWs as they seek work opportunities and services.